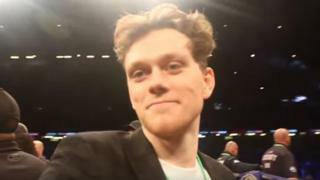 A YouTuber who appeared in the boxing ring after Anthony Joshua's heavyweight title defence is being investigated by police over an alleged security breach.Vlogger Zac Alsop posted footage online claiming he made a fake pass to get inside the Principality Stadium where Joshua beat Joseph Parker on Saturday.The stadium condemned the "irresponsible behaviour" as police investigate whether a criminal offence has taken place.Mr Alsop has been asked for a comment. Following the fight, Mr Alsop claimed he had got in to the sell-out event for free. A spokesman for South Wales Police said: "These irresponsible actions are a clear breach of stadium security protocols and could have placed this individual and others attending the event at risk. "We are currently investigating whether any criminal offences have been committed. "A spokesman for the Principality Stadium said: "We strongly condemn this sort of irresponsible behaviour. "In conjunction with all event promoters, we will be investigating the process around the issuing and management of credentials for third party events at the stadium."